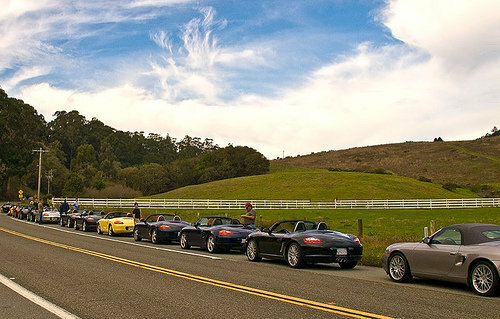 When Spring arrives in the Bay Area, there's no better way to celebrate the fresh air but in a Porsche. 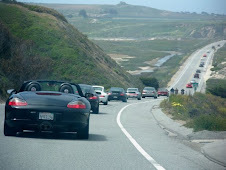 Consider this blog as a depository for awesome Porsche drives/tours in and around the San Francisco Bay Area and Northern California. Draw an imaginary line across the center of California. Anchor one end off the Monterey Area/Santa Cruz mountains, on the Pacific coast. Run the line east over the Coast Range, through the Central Valley, and over the Sierra Nevada mountains. Tether the other end of the line at the Nevada border, on the fringe of the Great Basin Desert. "Backroads of Northern California" covers the incomparable natural beauty, the myths and the history of the Golden State on the northern side of that line, while "Backroads of Southern California" does the honors for the lower half, from the San Joaquin Valley to the border with Mexico. TOURS are what they sound like - someone leads a bunch of Porschephiles hither-and-yon for the express purpose of having them follow onto great Porsche roads, go interesting places and generally have a wonderful time driving their cars. Nicolas Hunziker Automotive Fine Art on FACEBOOK…ENJOY! Reminder: And don’t forget to check out Nicolas Hunziker Apparel / Art @http://www.hunzikerapparel.com/ on the website too! Use that important code “dede” to receive your 15% off store wide discount..
Dedeporsches Blog---everything you want to know about Porsche & more! Walter Rohrl will once again stepping into his 600hp, 1000kg Audi Sport quattro S1 and spanking it up Pikes Peak. It's 25 years since the man navigated his way (mostly sideways) through 156 turns to the 4,301 metre summit of the legendary American course. In 1987 the two-time rally world champ - and his melon-sized testes - got up the mountain in a record breaking time of 10:47:85. And back then there were no guardrails and it was done on a loose sand and gravel surface. The new Porsche Boxster: Spirit, declared. I have added great information on specific drives on Facebook. Access the library on "Posted Items" of assorted drives/tours for the ideal trip best suited for the occasion. Northern California Road Trip - Muir Woods, Redwood, Lassen and more! Start and end in San Francisco. Mileage does not include sightseeing. Take a journey that explores National Parks, Monuments, National Seashores and more! This road trip also includes Lake Tahoe and a beautiful drive along the coast. You may want to extend the time to visit the numerous state parks and tourist areas. More Porsche destinations will follow. Stay Tuned! Garage419 - Car guys love to argue. Let the debate rage! É engano. Zuffenhausen é aqui ao lado. Be sure to check back often for more backroad destinations! Pack up the car and enjoy California backroads through the breathtaking mountains, spectacular valleys, rugged coastlines, and dry desert plains of the Golden State. Have fun exploring California’s best scenic byways and back roads.